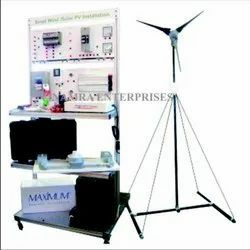 Pioneers in the industry, we offer solar inverter trainer kit, photo voltaic cell trainer, solar energy trainer kit, fuel cell trainer kit, wind energy trainer kit and pv system characterization kit from India. A multi-range dc ammeter and the mobile frame is constructed of code gauge furniture stock steel with four swivel casters, two with locks. Furnished complete with a set of interconnecting cords. According to the needs and specifications of the customers, we are providing them customized Photovoltaic Cell Trainer. 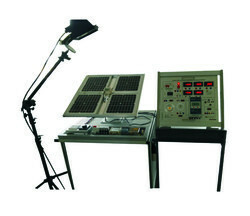 Also, our Photovoltaic Cell Trainer is extensively used in many laboratories for experiment. In addition, we produce this Photovoltaic Cell Trainer by using quality approved material and according to the international quality parameters. 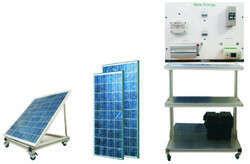 Solar Energy Trainer is a versatile training system to be used in laboratories. It introduces the basic concept of solar cell (photovoltaic cell) of converting sunlight directly into electrical energy. 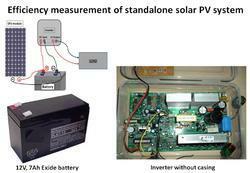 The system works as a live demonstration unit of solar cells in terms of its concepts and applications. This system is provided with Solar Energy Trainer and a Solar Panel. Fuel Cell Trainer is a modular experimental system designed tostudy the working of Solar-Hydrogen cycle. The Reversible FuelCell is unique, as it acts as both, an Electrolyzer and a Fuel Cell.This trainer demonstrates Chemistry and Physics principles byexperimenting with the splitting of water into its basic elements(hydrogen and oxygen) using renewable power generation fromphotovoltaic technology (solar panel) and then use this basicelement (hydrogen) of water as a renewable “energy carrier” thatcan power many applications with fuel cell technology. Wind Energy Trainer is a versatile training setup used in the laboratories to understand the conversion of wind energy into electrical supply. It introduces the basic concept of wind turbine, of converting kinetic energy of wind into mechanical energy and then this mechanical energy into electrical energy. The setup works as a live demonstration unit of wind turbine and generator in terms of its concepts and applications. It is provided with a Wind Turbine Setup and a Training Board. Photovoltaic Solar System Trainer is a laboratory scaled unit designed to study all the parameters involved in the solar radiation direct conversion into electricity. 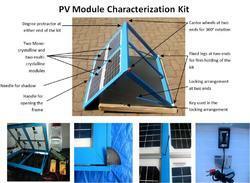 The trainer is based on some application modules and photovoltaic solar panels assembled in Portable structures. It is specially designed for the theoretical and practical study of the electrical installations with photovoltaic solar energy, the typical configurations used in photovoltaic installations and the operation of the different elements involved in the conversion. Experimental Training Board has been designed specifically for the study of Photo Voltaic Modules. Practical experience on this board carries great educative value for Science and Engineering Students. The two major parts of Trainer is Solar Cell and Monitoring Unit. Experimental Training Board has been designed specifically for the study of Photo Voltaic Modules. Practical experience on this board carries great educative value for Science and Engineering Students. 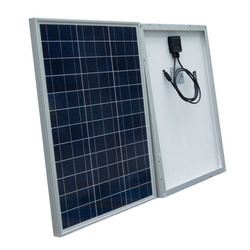 The two major parts of Trainer is PV Module SET with Frame and Monitoring Unit.